Fot this years sponsored bunny jump and leap from at the gym! 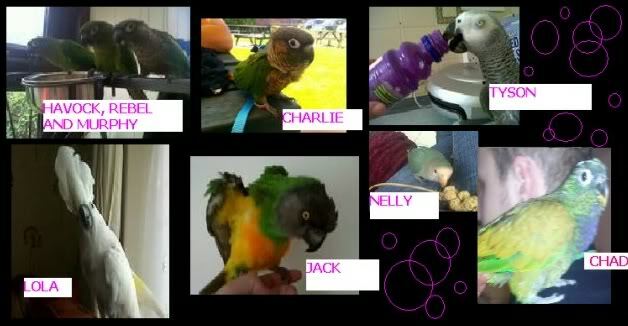 In aid of the Parrot Sanctuary that is! So do you fancy another birdy day for the kids? Sponsorship day is 3rd November, adults into gym is 10th November so either before or after those dates would be ideal! Anyone else? Should be loads more kids this time! And the swimming lessons are on too so plenty of people around and about! You tell me a date and I'll see if it's fine. 3rd and the 10th November are out as they are they days when I will be mega busy with the sponsorship activies, 8th December is out as that the christmas Disco. Any other saturdays are great. I'm just trying to sort out some stuff at work! Maybe the 17th but I'd need to be back by 4pm or as near as? Hollie, shell, sue, Mandy is that a good date? Gym finishes at 1.00pm, so it's pack up and go, or a quick cup of tea, though may be a bit cold to sit outside this time! Fine by me too. I'll have to bring Miss Show Off, Kai Lani, she loves those days. Who else I don't know yet. Ok, first part of the sponsorship was completed last saturday, teh kids did really well and money is starting to come in! This saturday is thne parents turn to take part in the gymnastics classes with their kids! Always fun! For me anyway! So a date when visiting parrots can get there is still to be decided. So Shell, Steve and Hollie.....decideif you can get here and which date pretty please?? ?